1775–1783: American Revolutionary War: an armed struggle for secession from the British Empire by the Thirteen Colonies that would subsequently become the United States. 1776–1777: Second Cherokee War: a series of armed conflicts when the Cherokee fought to prevent the encroachment of American settlers into eastern Tennessee and eastern Kentucky; under British rule, this land had been preserved as native territory. 1785–1795: Northwest Indian War: a series of battles with various native tribes in present-day Ohio. The goal of the campaign was to affirm American sovereignty over the region and to create increased opportunities for settlement. 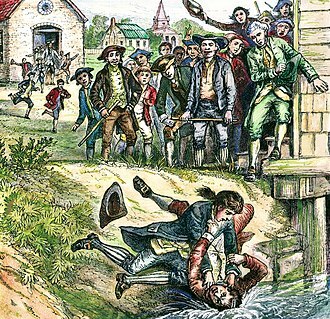 1786–1787: Shays' Rebellion: a Western Massachusetts debtor's revolt over a credit squeeze that had financially devastated many farmers. The federal government was fiscally unable to raise an army to assist the state militia in combating the uprising; the weakness of the national government bolstered the arguments in favor of replacing the Articles of Confederation with an updated governmental framework. 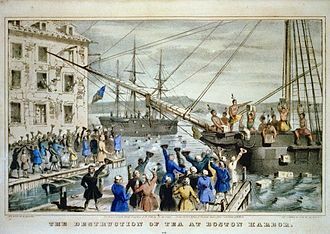 1791–1794: Whiskey Rebellion: a series of protests against the institution of a federal tax on the distillation of spirits as a revenue source for repaying the nation's war bonds. 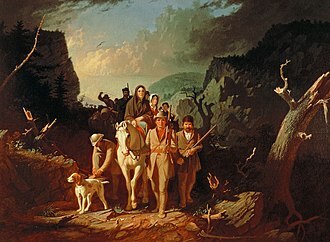 The revolt was centered upon southwestern Pennsylvania, although violence occurred throughout the Trans-Appalachian region. 1798–1800: Quasi-War: an undeclared naval war with France over American default on its war debt. Another contributing factor was the continuation of American trade with Britain, with whom their former French allies were at war. This contest included land actions, such as that in the Dominican Republic city of Puerto Plata, where U.S. Marines captured a French vessel under the guns of the forts. Congress authorized military action through a series of statutes. 1799–1800: Fries' Rebellion: a string of protests against the enactment of new real estate taxes to pay for the Quasi-War. Hostilities were concentrated in the communities of the Pennsylvania Dutch. 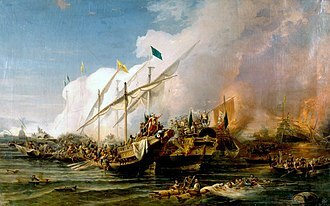 1801–1805: First Barbary War: a series of naval battles in the Mediterranean against the Kingdom of Tripoli, a quasi-independent state of the Ottoman Empire. 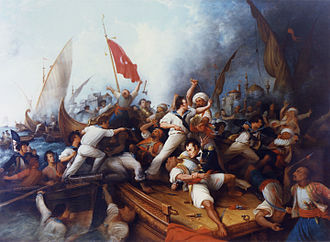 Action was in response to the capture of numerous American ships by the infamous Barbary pirates. The federal government rejected the Tripolitan request for an annual tribute to guarantee safe passage, and an American naval blockade ensued. After the seizure of USS Philadelphia, American forces under William Eaton invaded coastal cities. A peace treaty resulted in the payment of a ransom for the return of captured American soldiers and only temporarily eased hostilities. 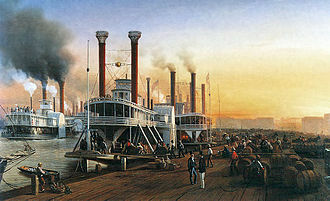 1806–1810: Action in the Gulf of Mexico: American gunboats operated from New Orleans against Spanish and French privateers off the Mississippi Delta, chiefly under Captain John Shaw and Master Commandant David Porter. 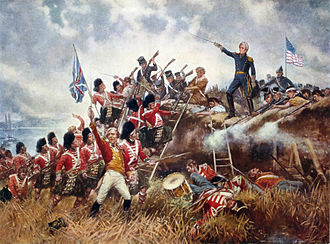 1812–1815: War of 1812: On June 18, 1812, the United States declared war against the United Kingdom. Among the issues leading to the war were British impressment of American sailors into the Royal Navy, interception of neutral ships and blockades of the United States during British hostilities with France. 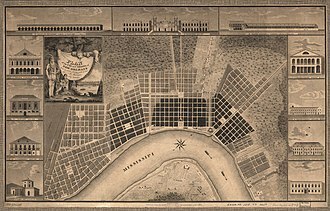 [RL30172] The war ended with the Battle of New Orleans in 1815. 1838: The Caroline affair on Navy Island, Canada: After the failure of the Upper Canada Rebellion of 1837 favoring Canadian democracy and independence from the British Empire; William Lyon Mackenzie and his rebels fled to Navy Island where they declared the Republic of Canada. American sympathizers sent supplies on SS Caroline, which was intercepted by the British and set ablaze, after killing one American. It was falsely reported that dozens of Americans were killed as they were trapped on board, and American forces retaliated by burning a British steamer while it was in U.S. waters. 1846–1848: Mexican–American War: On May 13, 1846, the United States recognized the existence of a state of war with Mexico. 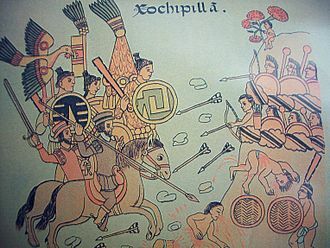 After the annexation of Texas in 1845, the United States and Mexico failed to resolve a boundary dispute and President Polk said that it was necessary to deploy forces in Mexico to meet a threatened invasion. 1857–1858: Utah War: The Utah War was a dispute between Mormon settlers in Utah Territory and the United States federal government. The Mormons and Washington each sought control over the government of the territory, with the national government victorious. The confrontation between the Mormon militia and the U.S. Army involved some destruction of property, but no actual battles between the contending military forces. 1861–1865: American Civil War: A major war between the United States (the Union) and eleven Southern states which declared that they had a right to secession and formed the Confederate States of America. 1865–1877: Southern United States – Reconstruction following the American Civil War: The South is divided into five Union occupation districts under the Reconstruction Act. 1878: Lincoln County, New Mexico: On July 15–19, during the Battle of Lincoln (1878) (part of the Lincoln County War) 150 cavalry-men arrived from Fort Stanton, under the command of Lieutenant George Smith (later Colonel Nathan Dudley) to assist the Murphy-Dolan Faction in attacking the Lincoln County Regulators vigilante group. 5 dead, 8–28 wounded. 1890: South Dakota: On December 29, soldiers of the US Army 7th Cavalry killed 178 Sioux Amerindians following an incident over a disarmament-inspection at a Lakota Sioux encampment near Wounded Knee Creek. 89 other Amerinds were injured, 150 were reported missing; Army casualties were 25 killed, 39 wounded. 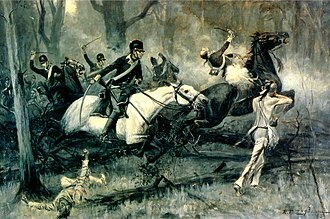 1891: Itata Incident: US and European naval forces intercepted and detained a shipment of arms sent to the Congressionalist forces in the Chilean Civil War. 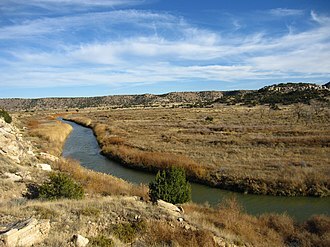 1892: Wyoming: Johnson County War April 11 to 13, U.S. Cavalry sent to break up a gun battle at the TA Ranch. 1898–1899: Samoa: Second Samoan Civil War, a conflict that reached a head in 1898 when Germany, the United Kingdom, and the United States were locked in dispute over who should have control over the Samoan island chain. 1899–1913: Philippine Islands: Philippine–American War, US forces protected American interests following the war with Spain, defeating Filipino revolutionaries seeking immediate national independence. [RL30172] The U.S. government declared the insurgency officially over in 1902, when the Filipino leadership generally accepted American rule. Skirmishes between government troops and armed groups lasted until 1913, and some historians consider these unofficial extensions of the war. 1914: Haiti: January 29 to February 9, February 20 and 21, October 19. Intermittently, U.S. naval forces protected American nationals in a time of rioting and revolution. [RL30172] The specific order from the Secretary of the Navy to the invasion commander, Admiral William Deville Bundy, was to "protect American and foreign" interests. 1915–1934: Haiti: From July 28, 1915 to August 15, 1934, United States occupation of Haiti. US forces maintained order during a period of chronic political instability. [RL30172] During the initial entrance into Haiti, the specific order from the Secretary of the Navy to the invasion commander, Admiral William Deville Bundy, was to "protect American and foreign" interests. 1918–1920: Russian SFSR: Marines were landed at and near Vladivostok in June and July to protect the American consulate and other points in the fighting between the Bolshevik troops and the Czech Army which had traversed Siberia from the western front. A joint proclamation of emergency government and neutrality was issued by the American, Japanese, British, French, and Czech commanders in July. In August 7,000 men were landed in Vladivostok and remained until January 1920, as part of an allied occupation force. In September 1918, 5,000 American troops joined the allied intervention force at the city of Arkhangelsk and remained until June 1919. These operations were in response to the Bolshevik revolution in Russia and were partly supported by Czarist or Kerensky elements. [RL30172] For details, see the American Expeditionary Force Siberia and the American Expeditionary Force North Russia. 1932: United States: "Bonus Army" of 17,000 WWI veterans plus 20,000 family cleared from Washington and then Anacostia flats "Hooverville" by 3rd Cavalry and 12th Infantry Regiments under Gen. Douglas MacArthur and Major Dwight D Eisenhower, July 28. 1941–1945: World War II: On December 8, 1941, the United States declared war against Japan in response to the bombing of Pearl Harbor. On December 11, Germany and Italy declared war against the United States. 1945–1949: Occupation of part of Germany. 1945–1955: Occupation of part of Austria. 1944–1946: Temporary reoccupation of the Philippines during World War II and in preparation for previously scheduled independence. 1945–1947: U.S. Marines garrisoned in mainland China to oversee the removal of Soviet and Japanese forces after World War II. 1946: Trieste, (Italy): President Truman ordered the increase of US troops along the zonal occupation line and the reinforcement of air forces in northern Italy after Yugoslav forces shot down an unarmed US Army transport plane flying over Venezia Giulia.. Earlier U.S. naval units had been sent to the scene. [RL30172] Later the Free Territory of Trieste, Zone A. 1961: Cuba: The Bay of Pigs Invasion, known in Hispanic America as Invasión de Bahía de Cochinos (or Invasión de Playa Girón or Batalla de Girón), was an unsuccessful military invasion of Cuba undertaken by the CIA-sponsored paramilitary group Brigade 2506 on April 17, 1961. 1965: Invasion of Dominican Republic: Operation Power Pack, The United States intervened to protect lives and property during a Dominican revolt and sent 20,000 U.S. troops as fears grew that the revolutionary forces were coming increasingly under Communist control. [RL30172] A popular rebellion broke out, promising to reinstall Juan Bosch as the country's elected leader. The revolution was crushed when U.S. Marines landed to uphold the military regime by force. 1967: Israel: The USS Liberty incident, whereupon a United States Navy Technical Research Ship was attacked June 8, 1967 by Israeli armed forces, killing 34 and wounding more than 170 U.S. crew members. 1972: North Vietnam: Christmas bombing Operation Linebacker II (not mentioned in RL30172, but an operation leading to peace negotiations). The operation was conducted from December 18–29, 1972. It was a bombing of the cities Hanoi and Haiphong by B-52 bombers. 1973: Operation Nickel Grass, a strategic airlift operation conducted by the United States to deliver weapons and supplies to Israel during the Yom Kippur War. 1980: Iran: Operation Eagle Claw, on April 26, 1980, President Carter reported the use of six U.S. transport planes and eight helicopters in an unsuccessful attempt to rescue the American hostages in Iran. 1980: U.S. Army and Air Force units arrive in the Sinai in September as part of "Operation Bright Star". They are there to train with Egyptian armed forces as part of the Camp David peace accords signed in 1979. Elements of the 101st Airborne Division, (1st Battalion, 502nd Infantry) and Air Force MAC (Military Airlift Command) units are in theater for four months & are the first U.S. military forces in the region since World War II. 1987: Persian Gulf: USS Stark was struck on May 17 by two Exocet antiship missiles fired from a Dassault Mirage F1 of the Iraqi Air Force during the Iran–Iraq War, killing 37 U.S. Navy sailors. 1987: Persian Gulf: Operation Nimble Archer. Attacks on two Iranian oil platforms in the Persian Gulf by United States Navy forces on October 19. The attack was a response to Iran's October 16, 1987 attack on the MV Sea Isle City, a reflagged Kuwaiti oil tanker at anchor off Kuwait, with a Silkworm missile. 1987–1988: Persian Gulf: Operation Earnest Will. After the Iran–Iraq War (the Tanker War phase) resulted in several military incidents in the Persian Gulf, the United States increased U.S. joint military forces operations in the Persian Gulf and adopted a policy of reflagging and escorting Kuwaiti oil tankers through the Persian Gulf to protect them from Iraqi and Iranian attacks. 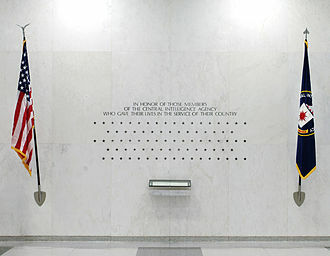 President Reagan reported that U.S. ships had been fired upon or struck mines or taken other military action on September 21 (Iran Ajr), October 8, and October 19, 1987 and April 18 (Operation Praying Mantis), July 3, and July 14, 1988. The United States gradually reduced its forces after a cease-fire between Iran and Iraq on August 20, 1988. [RL30172] It was the largest naval convoy operation since World War II. 1987–1988: Persian Gulf: Operation Prime Chance was a United States Special Operations Command operation intended to protect U.S.-flagged oil tankers from Iranian attack during the Iran–Iraq War. The operation took place roughly at the same time as Operation Earnest Will. 1988: Persian Gulf: Operation Praying Mantis was the April 18, 1988 action waged by U.S. naval forces in retaliation for the Iranian mining of the Persian Gulf and the subsequent damage to an American warship. 1988: Honduras: Operation Golden Pheasant was an emergency deployment of U.S. troops to Honduras in 1988, as a result of threatening actions by the forces of the (then socialist) Nicaraguans. 1988: USS Vincennes shoot-down of Iran Air Flight 655. 1989–1990: Panama: United States invasion of Panama and Operation Just Cause, On December 21, 1989, President Bush reported that he had ordered U.S. military forces to Panama to protect the lives of American citizens and bring General Noriega to justice. By February 13, 1990, all the invasion forces had been withdrawn. [RL30172] Around 200 Panamanian civilians were reported killed. The Panamanian head of state, General Manuel Noriega, was captured and brought to the U.S.
1991–1996: Iraq: Operation Provide Comfort, Delivery of humanitarian relief and military protection for Kurds fleeing their homes in northern Iraq during the 1991 uprising, by a small Allied ground force based in Turkey which began in April 1991. 1992–1996: Bosnia and Herzegovina: Operation Provide Promise was a humanitarian relief operation in Bosnia and Herzegovina during the Yugoslav Wars, from July 2, 1992, to January 9, 1996, which made it the longest running humanitarian airlift in history. 1993–1995: Bosnia: Operation Deny Flight, On April 12, 1993, in response to a United Nations Security Council passage of Resolution 816, U.S. and NATO enforced the no-fly zone over the Bosnian airspace, prohibited all unauthorized flights and allowed to "take all necessary measures to ensure compliance with [the no-fly zone restrictions]." 1993: Somalia: Battle of Mogadishu, or the First Battle of Mogadishu. October 3–4, 1993, Task Force Ranger, made up largely of the 75th Ranger Regiment and Delta Force entered hostile urban area Mogadishu to seize two high ranking S.N.A. leaders. 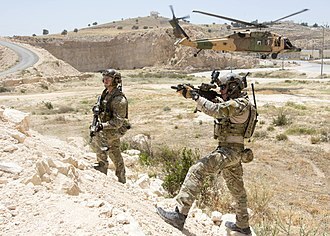 Two American UH-60 Black Hawks are shot down, 18 Americans are killed in action, with another 73 wounded, and 1 captured. 1994: Bosnia: Banja Luka incident, NATO become involved in the first combat situation when NATO U.S. Air Force F-16 jets shot down four of the six Bosnian Serb J-21 Jastreb single-seat light attack jets for violating UN-mandated no-fly zone. 1996: Central African Republic, Operation Quick Response: On May 23, 1996, President Clinton reported the deployment of U.S. military personnel to Bangui, Central African Republic, to conduct the evacuation from that country of "private U.S. citizens and certain U.S. government employees", and to provide "enhanced security for the American Embassy in Bangui. "[RL30172] United States Marine Corps elements of Joint Task Force Assured Response, responding in nearby Liberia, provided security to the embassy and evacuated 448 people, including between 190 and 208 Americans. The last Marines left Bangui on June 22. 1996: Kuwait: Operation Desert Strike, American Air Strikes in the north to protect the Kurdish population against the Iraqi Army attacks. 1996: Bosnia: Operation Joint Guard, On December 21, 1996, U.S. and NATO established the SFOR peacekeepers to replace the IFOR in enforcing the peace under the Dayton agreement. 2001: On April 1, 2001, a mid-air collision between a United States Navy EP-3E ARIES II signals surveillance aircraft and a People's Liberation Army Navy (PLAN) J-8II interceptor fighter jet resulted in an international dispute between the United States and the People's Republic of China called the Hainan Island incident. 2006: Lebanon: part of the 24th Marine Expeditionary Unit begins evacuation of U.S. citizens willing to leave the country in the face of a likely ground invasion by Israel and continued fighting between Hezbollah and the Israeli military. 2007 - The Mogadishu Encounter, on November 4, 2007, Somali Pirates boarded and attacked a North Korean merchant vessel. Passing U.S. Navy Ships and a helicopter that were patrolling at the time responded to the attack. Once the ship was freed from the pirates, the American forces were given permission to board and assist the wounded crew and handle surviving pirates. 2007: Somalia: Battle of Ras Kamboni, On January 8, 2007, while the conflict between the Islamic Courts Union and the Transitional Federal Government continues, an AC-130 gunship conducts an aerial strike on a suspected al-Qaeda operative, along with other Islamist fighters, on Badmadow Island near Ras Kamboni in southern Somalia. 2010–present: al-Qaeda insurgency in Yemen: The U.S. has been launching a series of drone strikes on suspected al-Qaeda, al-Shabaab, and ISIS positions in Yemen. 2010–2011: Operation New Dawn, On February 17, 2010, U.S. Secretary of Defense Robert Gates announced that as of September 1, 2010, the name "Operation Iraqi Freedom" would be replaced by "Operation New Dawn". 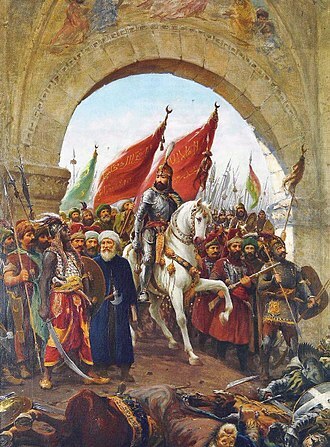 This coincides with the reduction of American troops to 50,000. 2011: Osama Bin Laden is killed by U.S. military forces in Pakistan as part of Operation Neptune Spear. 2012: Jordan: 150 U.S. troops deployed to Jordan to help it contain the Syrian Civil War within Syria's borders. 2012: Turkey: 400 troops and two batteries of Patriot missiles sent to Turkey to prevent any missile strikes from Syria. 2012: Chad: 50 U.S. troops have deployed to the African country of Chad to help evacuate U.S. citizens and embassy personnel from the neighboring Central African Republic's capital of Bangui in the face of rebel advances toward the city. 2013: Mali: U.S. forces assisted the French in Operation Serval with air refueling and transport aircraft. 2014–present: Uganda: V-22 Ospreys, MC-130s, KC-135s and additional U.S. soldiers are sent to Uganda to continue to help African forces search for Joseph Kony. 2014–present: American intervention in Iraq: Hundreds of U.S. troops deployed to protect American assets in Iraq and to advise Iraqi and Kurdish fighters. In August the U.S. Air Force conducted a humanitarian air drop and the U.S. Navy began a series of airstrikes against Islamic State-aligned forces throughout northern Iraq. 2014: 2014 American rescue mission in Syria: The U.S. attempted to rescue James Foley and other hostages being held by ISIL. Air strikes were conducted on the ISIL military base known as "Osama bin Laden camp". Meanwhile, the bombings, Delta teams parachuted near an ISIL high-valued prison. The main roads were blocked to keep any target from escaping. When no hostage was found, the American troops began house to house searches. By this time, ISIL militants began arriving to the area. 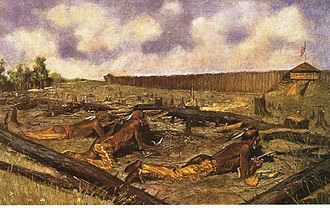 Heavy fighting occurred until the Americans decided to abandon the mission due to the hostages being nowhere in the area. Although the mission failed, at least 5 ISIL militants were killed, however 1 American troop was wounded. According to the reports, Jordan had a role in the operation and that one Jordanian soldier had been wounded as well. This was unconfirmed. 2014–present: American-led intervention in Syria: American aircraft bomb Islamic State positions in Syria. Airstrikes on al-Qaeda, al-Nusra Front and Khorasan positions are also being conducted. 2014–present: Intervention against the Islamic State of Iraq and the Levant: Syrian locals forces and American-led coalition forces launch a series of aerial attacks on ISIL and al-Nusra Front positions in Iraq and Syria. 2014: 2014 Yemen hostage rescue operations against al-Qaeda: On November 25, U.S. Navy SEALs and Yemeni Special Forces launched an operations in Yemen in attempt to rescue eight hostages that were being held by al-Qaeda. Although the operation was successful, no American hostages were secured. In the first attempt, six Yemenis, one Saudi Arabian, and one Ethiopian were rescued. On December 4, 2014, al-Qaeda in the Arabian Peninsula (AQAP) threatened to execute the Somers if the U.S. failed to the unspecified commands. AQAP also stated that they would be executed if the U.S. attempted another rescue operation. On December 6, a second operation was launched. 40 U.S. SEALs and 30 Yemeni troops were deployed to the compound. A 10-minute fire fight occurred before the American troops could enter where the remaining hostages (Somers and Korkie) were being held. They were alive, but fatally wounded. Surgery was done in mid air when flying away from the site. Korkie died while in flight, and Somers died once landed on USS Makin Island. No American troop was killed/injured, however a Yemenis soldier was wounded. 2015: April 30, 2015 U.S. sends ships to the Strait of Hormuz to shield vessels after Iranian seizure of a commercial vessel, MV Maersk Tigris. Iran fired shots over the bow, and seized the ship registered in the Marshall Islands, as part of a decade-long legal dispute between Iran and Maersk. 2015–present: In early October 2015, the US military deployed 300 troops to Cameroon, with the approval of the Cameroonian government; their primary mission was to provide intelligence support to local forces as well as conducting reconnaissance flights. 2017: 2017 Shayrat missile strike: Tomahawk missiles launched from US naval vessels in the Mediterranean hit a Syrian airbase in Homs Governorate in response to a chemical weapons attack against civilians south-west of Idlib. Seven were killed and nine wounded. ^ a b c d RL30172 RL30172: "Congressional Research Service report RL30172". Retrieved July 15, 2006. ^ "American History: The Mexican–American War". LegendsOfAmerica.com. Retrieved April 22, 2014. ^ Boot, Max (April 1, 2002). The Savage Wars of Peace: Small Wars and the Rise of American Power. Basic Books. p. 125. ISBN 0-465-00720-1. As many as 200,000 civilians also died, victims of disease and famine and the cruelties of both sides. * Kumar, Amitava (October 29, 1999). Poetics/Politics: Radical Aesthetics for the Classroom. Palgrave. ISBN 0-312-21866-4. In the fifteen years that followed the defeat of the Spanish in Manila Bay in 1898, more Filipinos were killed by U.S. forces than by the Spanish in 300 years of colonization. Over 1.5 million died out of a total population of 6 million. * Painter, Nell Irvin (May 1, 1989). Standing at Armageddon: The United States, 1877–1919. W. W. Norton & Company. p. 154. ISBN 0-393-30588-0. Hundreds of thousands of Filipinos died in battle, of disease, or of other war-related causes. * Guillermo, Emil (February 8, 2004). "A first taste of empire". Milwaukee Journal Sentinel: 03J. The Philippines: 20,000 military dead; 200,000 civilian dead. Some historians, however, put the toll higher – closer to 1 million Filipinos because of the disease and starvation that ensued. * Foster, John Bellamy; McChesney, Robert W. (November 1, 2003). "Kipling, the 'White Man's Burden,' and U.S. Imperialism". Monthly Review. 55 (6): 1. doi:10.14452/mr-055-06-2003-10_1. Retrieved January 21, 2013. Although a quarter of the million is the "consensual" figure of historians, estimates of Filipino deaths from the war have ranged as high as one million, which would have meant depopulation of the islands by around one-sixth. ^ Frank, Benis M. (1968). "History of U.S. Marine Corps Operations in World War II, Volume V: Victory and Occupation". Historical Branch, G-3 Division, Headquarters, U.S. Marine Corps. Retrieved March 18, 2009. ^ a b "Persian Gulf War - Facts & Summary - HISTORY.com". HISTORY.com. Retrieved 2017-12-08. ^ John Pike. "Operation Provide Promise from www.globalsecurity.org". Retrieved October 1, 2014. ^ "Text of a Letter from the President to the Speaker of the House of Representatives and the President Pro Tempore of the Senate". The White House. September 26, 2002. Retrieved April 18, 2007. ^ "Presidential Letter". The White House. September 19, 2003. Retrieved April 17, 2007. ^ "Presidential Letter". The White House. March 20, 2004. Retrieved April 17, 2007. ^ a b "Lebanon Non-combatant Evacuation Operation (NEO) 2006". globalsecurity.org. Retrieved October 4, 2007. ^ Josh White (July 18, 2006). "U.S. Prepares Huge Lebanon Evacuation". Washington Post. p. A12. Retrieved October 4, 2007. ^ Declan Walsh. "Pilotless Drone strikes begin in Somalia". the Guardian. Retrieved October 1, 2014. ^ Secret ‘Kill List’ Proves a Test of Obama’s Principles and Will, May 29, 2012, The New York Times. ^ "Sources: Drone strikes in Yemen kill 6, including senior AQAP leaders - CNN.com". CNN. August 30, 2013. ^ "Obama sends 100 troops to combat LRA in Uganda". The Guardian. London. October 14, 2011. ^ "U.S. forces raid terror targets in Libya, Somalia - CNN.com". CNN. October 6, 2013. ^ "U.S. sending special operations forces, CV-22 Ospreys to Uganda". Navy Times. Retrieved October 1, 2014. ^ "The US Is Flying Right Into The Iran-Russia-Syria Plan In Iraq". Yahoo Finance. July 3, 2014. Retrieved October 1, 2014. ^ "Obama authorizes targeted airstrikes in Iraq". August 7, 2014. Retrieved October 1, 2014. ^ "U.S. Sends Ships to Strait of Hormuz To Shield Vessels After Iran Seizure". May 1, 2015. Retrieved May 6, 2015. ^ "Syria: Donald Trump orders missile strike against Assad airfield in retaliation for chemical attack". ABC News (Australia). Australian Broadcasting Corporation. 7 April 2017. Retrieved 7 April 2017. Slave Traffic "African Slave Trade Patrol – 1820–1861". GlobalSecurity.org. Retrieved April 15, 2007. Vandalia 1 "Vandalia". historycentral.com/navy. Archived from the original on May 3, 2007. Retrieved April 16, 2007. Vandalia 2 "USS Vandalia (1876–1889)". U.S. Department of the Navy – Naval Historical Center. Retrieved April 16, 2007. 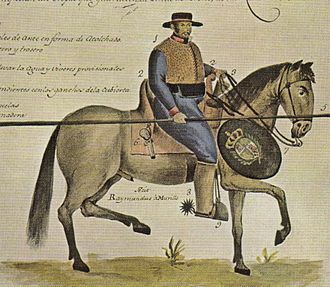 1859 Mexico "Juan Cortina (1824–1892)". www.pbs.org. Retrieved April 16, 2007. Vietnam timeline "Vietnam War Timeline". 7th Bn, 15th Arty Org. Archived from the original on April 16, 2007. Retrieved April 17, 2007. U. S. foreign policy and foreign aid have been the subject of much debate and criticism, both domestically and abroad. The United States Secretary of State is the minister of the United States and is the primary conductor of state-to-state diplomacy. Both the Secretary of State and ambassadors are appointed by the President, with the advice, Congress has power to regulate commerce with foreign nations. The main trend regarding the history of U. S, since the 19th century, U. S. foreign policy has been characterized by a shift from the realist school to the idealistic or Wilsonian school of international relations. 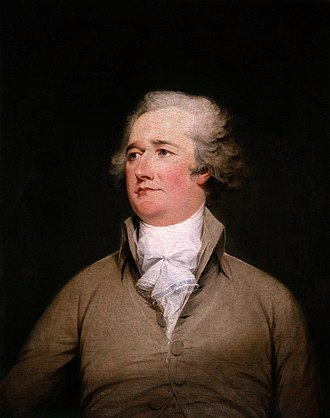 These policies became the basis of the Federalist Party in the 1790s, but the rival Jeffersonian feared Britain and favored France in the 1790s, declaring the War of 1812 on Britain. After the 1778 alliance with France, the U. S. did not sign another permanent treaty until the North Atlantic Treaty in 1949, over time, other themes, key goals, attitudes, or stances have been variously expressed by Presidential doctrines, named for them. Initially these were uncommon events, but since WWII, these have made by most presidents. 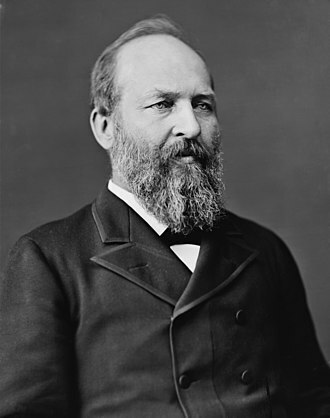 The U. S. bought Alaska from the Russian Empire in 1867, victory over Spain in 1898 brought the Philippines, and Puerto Rico, as well as oversight of Cuba. The short experiment in imperialism ended by 1908, as the U. S. turned its attention to the Panama Canal, the 20th century was marked by two world wars in which the United States, along with allied powers, defeated its enemies and increased its international reputation. 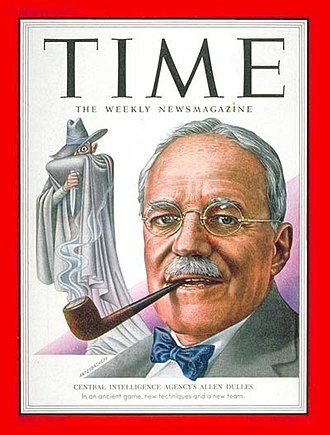 President Wilsons Fourteen Points was developed from his idealistic Wilsonianism program of spreading democracy and it became the basis of the German Armistice and the 1919 Paris Peace Conference. In the 1920s, the United States followed an independent course, and succeeded in a program of naval disarmament, operating outside the League it became a dominant player in diplomatic affairs. New York became the capital of the world, but the Wall Street Crash of 1929 hurled the Western industrialized world into the Great Depression. 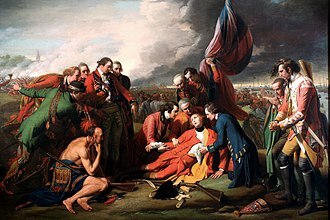 Under the Treaty of Paris, which ended the American Revolutionary War, Great Britain ceded to the U. S. control of the Northwest Territory, which was occupied by numerous Native American peoples. 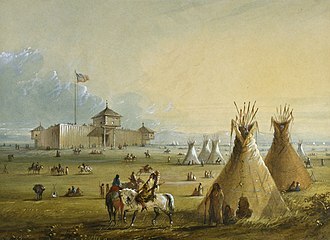 Despite the treaty, the British kept forts there and continued policies that supported the Native Americans in the Northwest Territories, in 1787, there were 45,000 Native Americans in the territory, and 2,000 French. 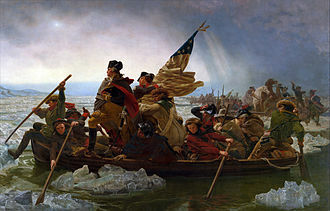 President George Washington directed the United States Army to enforce U. S. sovereignty over the territory, about 1,000 soldiers and militiamen were killed and the United States forces suffered many more casualties than their opponents. After St. Clairs disaster, Washington ordered Revolutionary War hero, General Mad Anthony Wayne, to organize, Wayne took command of the new Legion of the United States late in 1793. He led his men to a victory at the Battle of Fallen Timbers in 1794. The defeated tribes were forced to cede territory, including much of present-day Ohio. The land east of the Mississippi River and south of the Great Lakes had been fought over for centuries before the United States government was formed. 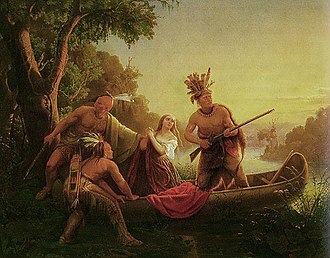 In 1608, French explorer Samuel Champlain sided with the Huron people living along the St. Lawrence River against the Haudenosaunee Confederacy living in what is now upper and western New York state. The result was a lasting enmity by the Haudenosaunee Confederacy towards the French, the Dutch offered better prices than the French and traded firearms and knives to the Iroquois in exchange for furs. The Native American tribes were competing for hunting grounds for the fur trade, the western tribes had been weakened by epidemics of European infectious diseases, against which they had no acquired immunity. The Five Nationss use of weapons caused the wars to become deadlier. Historians consider the Beaver Wars to have one of the bloodiest conflicts in the history of North America. About 1664, the Five Nations became trading partners with the British, the Five Nations enlarged their territory by right of conquest. The number of paying tribute to them realigned the tribal map of eastern North America. American imperialism is the economic and cultural philosophy that the United States affects and controls other countries. Such influence is often associated with expansion into foreign territories. In turn, historian Sidney Lens notes that the urge for expansion – at the expense of other peoples – goes back to the beginnings of the United States itself. Yale historian Paul Kennedy put it, From the time the first settlers arrived in Virginia from England and started moving westward, this was an imperial nation, a conquering nation. In a 2008 address to Boston University, Noam Chomsky stated that talking about American imperialism is rather like talking about triangular triangles, detailing George Washingtons description of the early United States as an infant empire, Benjamin Franklins writing that the Prince that acquires new Territory. Removes the Natives to give his own People Room, stuart Creighton Miller says that the publics sense of innocence about Realpolitik impairs popular recognition of U. S. imperial conduct. S.
Uniquely, was proceeding along a path to no limit can be perceived. American exceptionalism is popular among people within the U. S. but its validity, some American citizens will participate in exceptionalism without even being aware of it. Such instances occur when American interests and advancements are justified solely on the basis of its economic standing or the protection of human rights, the American publics attitude towards intervention in Cuba and the Philippines was one of enthusiasm. As a Monthly Review editorial opines on the phenomenon, in Britain, and in the United States, empire does not even exist, we are merely protecting the causes of freedom and justice worldwide. When World War I broke out in Europe, President Woodrow Wilson promised American neutrality throughout the war and this promise was broken when the United States entered the war after the Zimmermann Telegram. The war for the United States was a war for empire according to the historian W. E. B, du Bois, as historian Howard Zinn explains in his book, A Peoples Republic. Zinn argues that the United States entered the war in order to create a market that could be beneficial to the United States through conquest. During the First World War, some of the American Imperialism at the time can be viewed as imperialism to stop the spread of democracy to certain countries, bourne criticizes intellectuals who gave support for the war without knowing the true intentions of the United States government. The United States invaded Haiti in July 1915 after having made eight times previously. American rule in Haiti continued through 1942, but was initiated during World War I, the historian Mary Renda in her book, Taking Haiti, talks about the American invasion of Haiti to bring about political stability through U. S. control. The American government did not believe Haiti was ready for self-governing or democracy, while Haiti had been running their own government for many years before American intervention, the U. S. government regarded Haiti as unfit for self-rule. In order to convince the American public of the justice in intervening, the Haitian government would come to agree to U. S.
USS Philadelphia, a 1240-ton, 36-gun sailing frigate, was the second vessel of the United States Navy to be named for the city of Philadelphia. Originally named City of Philadelphia, she was built in 1798–1799 for the United States government by the citizens of that city, funding for her construction was the result of a funding drive which raised $100,000 in one week, in June 1798. She was designed by Josiah Fox and built by Samuel Humphreys, Nathaniel Hutton and her carved work was done by William Rush of Philadelphia. She was laid down about November 14,1798, launched on November 28,1799 and she is perhaps best remembered for her burning after being captured in Tripoli. 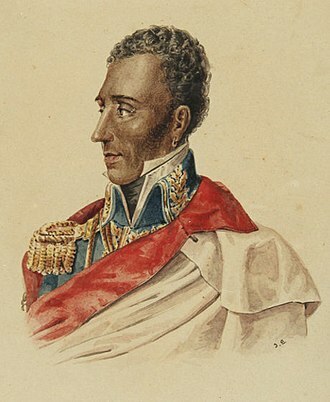 Putting to sea for duty in the West Indies to serve in the Quasi-War with France, she arrived on the Guadeloupe Station in May 1800, during this cruise she captured five French armed vessels and recaptured six merchant ships that had fallen into French hands. Returning home in March 1801, she was ordered to prepare for a cruise in the Mediterranean in a squadron commanded by Commodore Richard Dale. At his own request, Decatur was relieved of the command of President by Captain Samuel Barron, the squadron arrived at Gibraltar on July 1, with Commodore Dale in the frigate President. Philadelphia was directed to cruise the Straits and blockade the coast of Tripoli, Philadelphia departed Gibraltar for the United States in April 1802, arriving in mid-July. In ordinary until May 21,1803, when she recommissioned, the Captain, William Bainbridge, tried to refloat her, first laying the sails back, and casting off three bow anchors and shifting the guns rear-ward. But a strong wind and rising waves drove her further aground, next they dumped many of her cannons, barrels of water, and other heavy articles overboard in order to make her lighter but this too failed. They sawed off the foremast in one last desperate attempt to lighten her and her officers and men were made slaves of the Pasha. Philadelphia, which had been refloated by her captors, was too great a prize to be allowed to remain in the hands of the Tripolitanians, so a decision was made to recapture or destroy her. 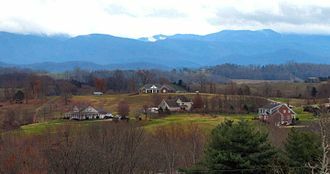 East Tennessee comprises approximately the eastern third of the U. S. state of Tennessee, one of the three Grand Divisions of Tennessee defined in state law. East Tennessee consists of 33 counties,30 located within the Eastern Time Zone, East Tennessee is entirely located within the Appalachian Mountains, although the landforms range from densely forested 6, 000-foot mountains to broad river valleys. The region contains the cities of Knoxville and Johnson City, Tennessees third and ninth largest cities. East Tennessee is home to the nations most visited national park— the Great Smoky Mountains National Park—, Oak Ridge was the site of the worlds first successful uranium enrichment operations which paved the way for the atomic age. Unlike the geographic designations of regions of most U. S. states, East Tennessee, along with Middle Tennessee and West Tennessee, comprises one of the states three Grand Divisions. According to the Tennessee State Constitution, no more than two of the Tennessee Supreme Courts five justices can come from any one Grand Division, the Supreme Court rotates meeting in courthouses in each of the three divisions. The Supreme Court building for East Tennessee is in Knoxville, a similar rule applies to certain other commissions and boards as well, to prevent them from showing a geographic bias. The Blue Ridge section comprises the section of the Blue Ridge Province. The Ridge-and-Valley section, often called the Tennessee Valley or Great Valley, is the regions largest and most populous section and it consists of a series of alternating elongate ridges and broad river valleys roughly oriented northeast-to-southwest. Other notable rivers in the upper Tennessee watershed include the Clinch, Watauga, Little Tennessee, Sequatchie, notable ridges in the Ridge-and-Valley range include Clinch Mountain, Bays Mountain, and Powell Mountain. The Cumberland Plateau rises nearly 1,000 feet above the Tennessee Valley, the Tennessee Divide runs along the western part of the plateau, and separates the watersheds of the Tennessee and Cumberland rivers. Plateau counties mostly east of this divide— i. e. Cumberland, three counties— Bledsoe and Marion— are located in the Sequatchie Valley, a long narrow valley in the southern part of the Cumberland Plateau. The military history of the United States spans a period of over two centuries. 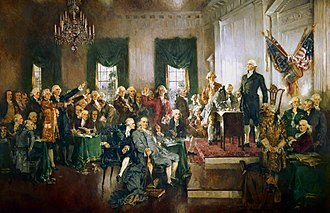 The Continental Congress in 1775 established the Continental Army and named General George Washington its commander and this newly formed army, along with state militia forces, the French Army and Navy, and the Spanish Navy defeated the British in 1781. 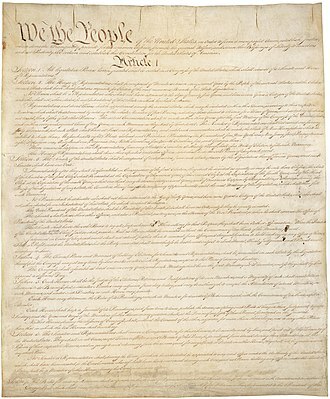 The new Constitution in 1789 made the president the commander in chief, with authority for the Congress to levy taxes, make the laws, and declare war. As of 2017, the U. S. military consists of the Army, Marine Corps and Air Force, there is the United States Coast Guard, which is controlled by the Department of Homeland Security. Governors have control of each states Army and Air National Guard units for limited purposes, the president has the ability to federalize National Guard units, bringing them under the sole control of the Department of Defense. The beginning of the United States military lies in civilian frontier settlers, armed for hunting and they relied on the British regular Army and Navy for any serious military operation. In major operations outside the locality involved, the militia was not employed as a fighting force, instead the colony asked for volunteers, many of whom were militia members. 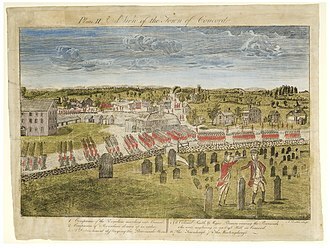 This final war was to give thousands of colonists, including Virginia colonel George Washington, when shooting began at Lexington and Concord in April 1775, militia units from across New England rushed to Boston and bottled up the British in the city. The Continental Congress appointed George Washington as commander-in-chief of the newly created Continental Army and he drove the British out of Boston but in late summer 1776 they returned to New York and nearly captured Washingtons army. Meanwhile, the revolutionaries expelled British officials from the 13 states, the British, for their part, lacked both a unified command and a clear strategy for winning. 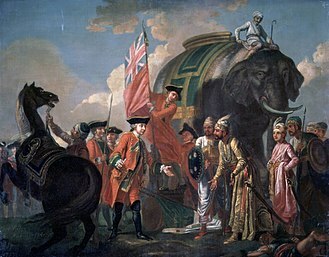 With the use of the Royal Navy, the British were able to capture coastal cities, a British sortie from Canada in 1777 ended with the disastrous surrender of a British army at Saratoga. With the coming in 1777 of General von Steuben, the training and discipline along Prussian lines began and Spain entered the war against Great Britain as Allies of the US, ending its naval advantage and escalating the conflict into a world war. The Netherlands joined France, and the British were outnumbered on land and sea in a world war, the main British army was surrounded by Washingtons American and French forces at Yorktown in 1781, as the French fleet blocked a rescue by the Royal Navy. The British sued for peace, as a battlefield tactician Washington was often outmaneuvered by his British counterparts. As a strategist, however, he had a idea of how to win the war than they did. The British sent four invasion armies, Washingtons strategy forced the first army out of Boston in 1776, and was responsible for the surrender of the second and third armies at Saratoga and Yorktown. He limited the British control to New York and a few places while keeping Patriot control of the majority of the population. A commander of Fort Patrick Henry sent Henry Timberlake as a token of friendship after the Anglo-Cherokee War. 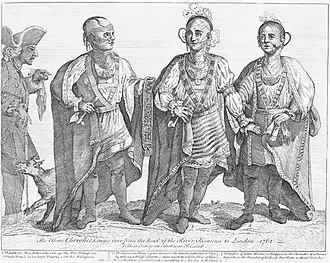 Timberlake later took three Cherokee to London, 1763. Seneca Chief Cornplanter was a leader of the moderate faction at the 1792 Grand Council on the Auglaize River. Floating saloons on the Pearl River. The "Blue Goose" (left) and "Freeman Saloon" (center), near Old Gainesville, Hancock County, Mississippi, 1907.